If you are like 40% of Americans, chances are you have a list of New Year’s resolutions you intend to adhere to in 2014. It may be to lose weight or to spend more time with family and friends, but have you considered resolving to care for your smile? After all, eHarmony recently conducted a survey that identified a healthy smile as one of the top 10 characteristics women love about men. 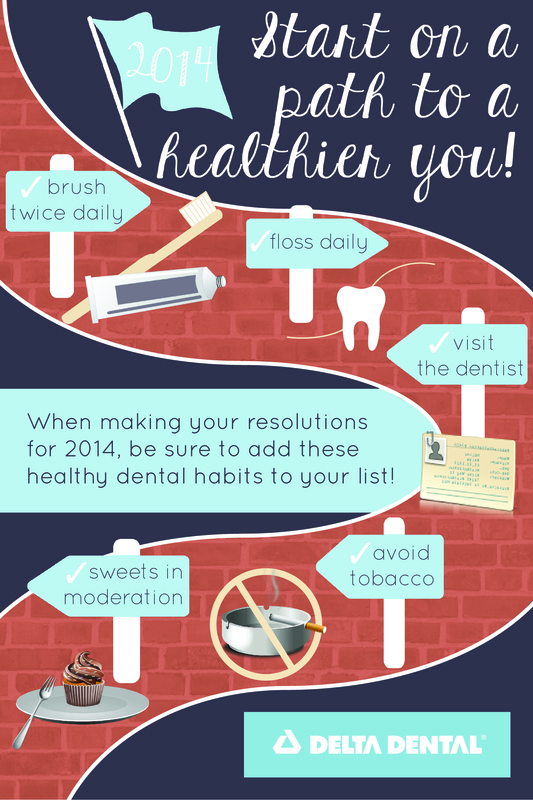 So, why wouldn’t you resolve to take better care of your teeth? Brush/floss regularly: The uncomplicated daily one-two punch of brushing twice a day with fluoride toothpaste and flossing once daily is still the foundation for maintaining healthy teeth and gums. The sooner you can brush following a meal, the better. The longer food stays stuck to your teeth, the more acid is produced that erodes tooth enamel. Visit your dentist: Don’t delay making an appointment for a check-up. Dentists do more than just check and clean teeth. They can also check for signs of serious oral health problems like oral cancer and gum disease, answer adult and pediatric dental questions and alert patients to signs of potential medical conditions. Avoid tobacco products: According to the Centers for Disease Control and Prevention (CDC), half of the cases of severe gum disease in U.S. adults can be attributed to cigarette smoking, and the prevalence of gum disease is three times higher among smokers than non-smokers. Consuming products like cigarettes, cigars and smokeless tobacco is arguably the single most destructive oral health habit. Eat sweets in moderation: It was the ancient Greek philosopher Aristotle who advised, “Moderation in all things,” and that axiom rings especially true for sweet snacks. Tooth decay occurs when candy, cookies, sodas and other sweets, or simple carbohydrates like those in chips or crackers, mix with bacteria in the sticky plaque that constantly forms on teeth to produce acid and destroy tooth enamel. Whenever possible, stick to eating sweets with dinner and brush afterward. Limit sugary snacks because the more times during the day that your teeth are exposed, the longer the acids attack. It can be so hard to eat sweets in moderation though. So very hard. However, this is a good tip for people to know. If you eat too many and don’t bother taking proper care of your teeth, you could end up needing dental implants one day.